This time of year is when it seems like everyone is under the weather. Sick. Colds, fevers, sore throats and all the other general winter ills are everywhere. A few weeks ago my hubby got really sick and didn't want to eat much of anything. He was run down and working late hours and by the time he got home every night he was a shadow of himself (you can pull out the tiny violins for him right about now). Chicken soup is known for its healing properties and I've always believed it's good for the soul too. 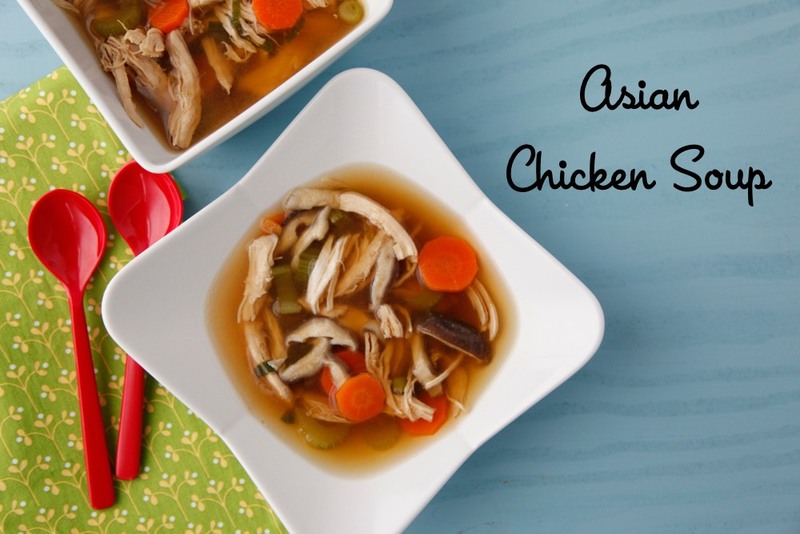 Wanting to make my weary husband something packed with nutrition and power from restorative veggies like ginger and mushrooms, I threw together this simple Asian Chicken soup. It's really clean and as hubby will testify (since it is the only thing he would eat that week) it just makes you feel good. The kids couldn't get enough of it either and especially liked sucking on the coins of ginger which soften from steeping in the warm broth. So in the unfortunate event that you or one of your loved ones succumb to a cold or some other bug, instead of immeditately reaching for a bottle of syrupy cough medicine or a pack of cold pills, try making a cup of ginger lemon tea, sip on a mug full of this soup, hit the hay, and let nature deliciously heal all. 1. In a large sauce pot, cover the chicken breasts and the ginger with the chicken stock, bring to a boil, and reduce heat to a simmer. Cook for 20 minutes, until the chicken is cooked through. 2. Remove the chicken and ginger from the pot, and place on a plate to cool. If desired, keep the ginger and add back to the soup, or you can discard it if you don’t want to bite into chunks of ginger. 3. Add the remaining ingredients to the pot and stir to combine. 4. Shred the chicken, add it back to the pot, and serve soup hot. This is fantastic Catherine. This is serious feel good food. Love! Looks so delicious! Perfect when you're feeling ill or on a cold day! Could you specify how many pounds of chicken breast are needed for this recipe? Thanks. YUMMY! 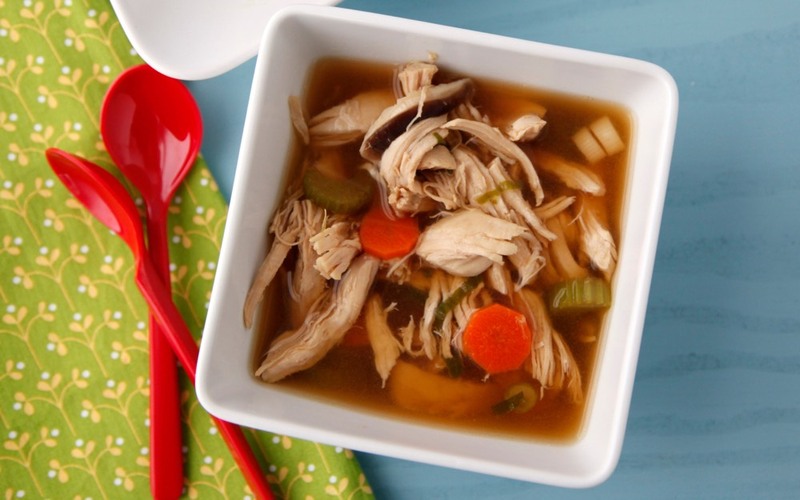 We love homemade chicken soup in this house, and although my go-to recipe is delicious, we're all a little bit sick of it. Can't wait to make this! Thank you for sharing! I made this last night as my kids and I have been sick for almost two weeks. We all loved it!! It was so good we finished it off and my 15 year old asked if I could make it again for lunch today. Thank you!!!! We make something similar all the time and serve with rice noodles for extra-slurping! Can't get enough soup this time of year. Another great, easy recipe that everyone loved. Between three of us we hardly had leftovers. My 23 month old at 4 bowls and then another when dad came home. Thank you!